1. 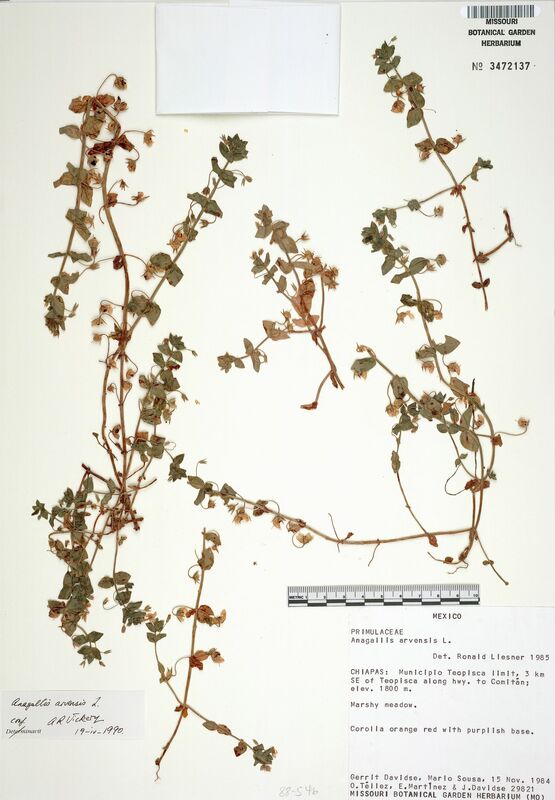 Anagallis arvensis Linnaeus, Sp. Pl. 1: 148. 1753. Herbs annual or biennial, 10--30 cm tall. Stems quadrangular, short winged on ridges, usually branched from base. Leaves opposite, occasionally in whorls of 3, sessile, ovate to narrowly ovate, 7--18(--25) X 3--12(--15) mm, minutely glandular punctate mainly abaxially, base subrounded, margin entire, apex obtuse or acute. Pedicel recurved in fruit, 2--3 cm. Calyx lobes linear-lanceolate, 3.5--6 mm, hyaline margined, apex long acuminate, costate. Corolla blue or red, rotate, 4--6 mm, parted nearly to base; lobes obovate-elliptic, 2.7--3 mm wide, margin entire to denticulate. Stamens 1/3--1/2 as long as corolla; filaments pubescent. Style ca. 1.5 mm. Capsule ca. 3.5 mm in diam. 2n = 22, 28, 40@. Cultivated areas, wasteland, roadsides. Fujian, Guangdong, Taiwan, Zhejiang [Bhutan, India, Japan, Kashmir, Nepal, Pakistan, Russia; NW Africa, W Asia, Australia, Europe, North America, South America].